Steady rain forced one of Commencement week’s usual outdoor events inside on Wednesday. But the wet weather did nothing to detract from the Reserve Officers’ Training Corps (ROTC) celebration that commissions Harvard men and women as officers in the U.S. military. Proud parents, family members, and friends applauded and cheered, and shed more than a few tears, as four men and one woman from the Class of 2013 were honored during the late morning service in Boylston Hall’s Fong Auditorium. Air Force 2nd Lt. Courtney Diekema from Holland, Mich., a comparative government concentrator, will be assigned to Goodfellow Air Force Base in San Angelo, Texas. Navy Ensign Colin Dickinson of Garden City, N.Y., an economics concentrator with a secondary concentration in organismic and evolutionary biology, will enter the Navy Supply Corps School in Newport, R.I. Marine Corps 2nd Lts. Brian Furey of Portland, Maine, an economics concentrator, and Gavin Pascarella of Corona, Calif., a government concentrator, both are being assigned to the Basic School in Quantico, Va. Physics concentrator and Navy Midshipman Christian Yoo of Bronxville, N.Y., will be commissioned and receive his first assignment at a later date. The event’s 50th reunion guest speaker was retired Air Force Lt. Col. David R. Downer, who studied at the Harvard Graduate School of Design (GSD) for two years after graduating from Harvard College in 1963. Downer offered words of wisdom gleaned from decades in the service traveling the world during tours of duty as a civil engineer. Harvard President Drew Faust praised the graduating Harvard students for their dedication and commitment to serve, and lauded the more than 300 students now enrolled at Harvard following military service, either on a break from duty to develop new skills, or as they transition to civilian life. Those students include an Air Force major now at the GSD studying how urban infrastructure and design shapes violent urban frontlines, who hopes to help governments mitigate conflict in divided cities; and 16 veterans at Harvard Law School, including a West Point graduate who defused bombs while she was serving in Afghanistan. Faust said an important reason she welcomed ROTC back to Harvard was to help others understand the military, and the impact that military experience makes on those who serve. 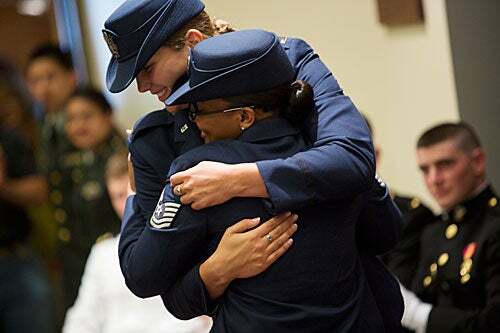 The best way to thank our veterans, she added, is to meet their needs better. In 2011, Faust worked closely with Secretary of the Navy Ray Mabus to return ROTC to Harvard’s campus after a 40-year absence. Courtney Diekema (left) gets a congratulatory hug.